When a letter begins with the words, “Sit down,” a big announcement is sure to follow. That was how my great-uncle-and-aunt, Phillip and Benita (McGinnis) McCormick, learned that their daughter, Jane, had married her true love, Eldon “Ole” Olson, in a private church ceremony in Carmel-by-the-Sea, California, in May of 1960. Reading the news in their Barcelona pension, some 5,000 miles away from home, they were undoubtedly surprised, though maybe not entirely. True, it had been easier to see their son, Bud, marry and start a family, but letting go of their daughter was tougher to do. They had to admit that she did what they would want her to do, which was to follow her heart and do things her own way. Besides, she had tried her best to cushion the news. Madonnas, it now sits on my dressing table. In characteristic fashion, Uncle Phil and Aunt Detty rose to the occasion. Swallowing their pride, they sent her and Ole their congratulations and decided to extend their stay a while longer. And being the larger-than-life couple they were, even in their 70s, their idea of “a while” turned into a year. Spain, a place to retreat in a moment of uncertainty as they struggled to give their daughter some room to grow, became the place of their rebirth and rediscovery. They made the rounds of the major art museums and architectural jewels, not just in Catalonia but throughout the country and became active members of the local artists’ colony. Uncle Phil, already somewhat familiar with Spanish, began taking a conversational class so he could talk to people during his long walks through town. Aunt Detty, always looking to reinvent herself artistically, signed on with a master artist to learn the art of gold leaf. I’ve had 6 days of wonderful gold-leaf application. Yesterday I g.l. a little shelf. Today I do the Virgin (plaster) that I helped repair & prepared for g.l. yesterday. There is no one I know of in our country doing this gold and silver work and after we tour the rest of E, we may return here for Sept. & Oct. do do further study with this wonderful maestro – the head of the craft in Barcelona. We work in his studio-workshop – the former stables of a castle (walled – even now, if you please) and so old that even Antonio’s father, who had the place before him, doesn’t know its age. 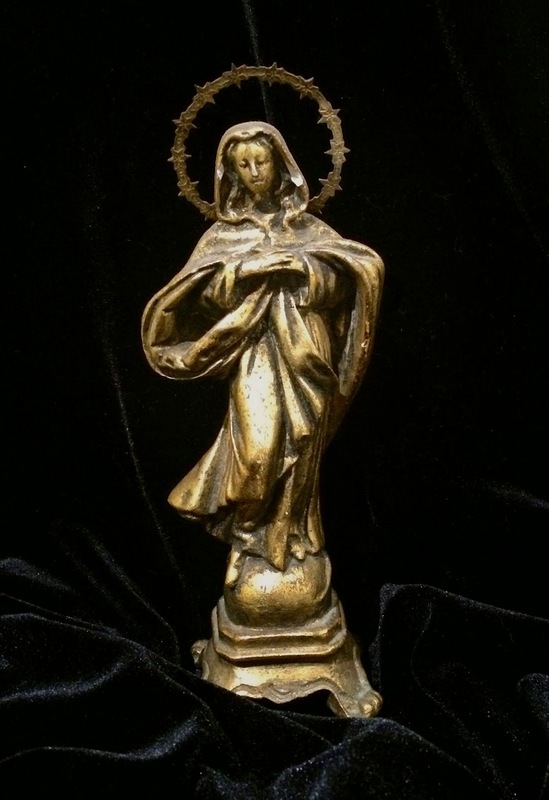 I wonder if the small statue of the Virgin Mary, shown in the picture above, is the same plaster Virgin that Aunt Detty was gold leafing? My cousin, her granddaughter Suzanne (Olson) Wieland, gave it to me a couple of years ago, one of a collection of Madonnas Aunt Detty brought back from Spain. Each day our lesson from 4:30 pm till 8 pm is punctuated by loud rings of the bell to admit some visitor, or client, to meet the “Americana.” [The maestro’s] daughter, 14, brings her school friends and his sister-in-law came to check on me. . . . Evidently I pass muster, look harmless, and so get the welcome Española! I love them all. Aunt Detty and Uncle Phil were especially taken by the Spaniards’ slower pace of life, their philosophy that there is always mañana – another day, and that if things don’t resolve themselves right away, they will work themselves out eventually. In the same letter to my parents, she marvels at this slower pace of life. Joan, this is a week to the day from the start of this note…. you also know what mañana means – Mary Harlow told me that if a Spaniard says “Mañana – mañana” that really means the next day. but life is so full here – I can understand how it takes months to get things done. No wonder they think we do everything by “machinas” we move so much faster than they. As with everything else they did, Phil and Benita McCormick wholeheartedly embraced the lifestyle of mañana. Sure enough, they gradually accepted the idea of Jane’s being married and lovingly welcomed their new son-in-law, Ole Olson.